After 3 days away in Krakow, Bethany came back today around 4pm to the delight of the kids and me. I did my best to have the house clean and ready for her return because well, I think that’s some kind husband law. We actually left the house shortly after she arrived to take the kids to play, so I enjoyed hearing about her time with the ladies. They did a study through the book of Job on “Doing Hard Things Well” and Bethany was blessed. She also told me that the weather was pretty wild today in Poland with wind, rain, sleet, and snow coming down as they were trying to grab lunch and leave town. It’s never easy being pregnant and walking through an old city when its cold and miserable. Thankfully they all made it home safe and we’re happy to have mommy back! 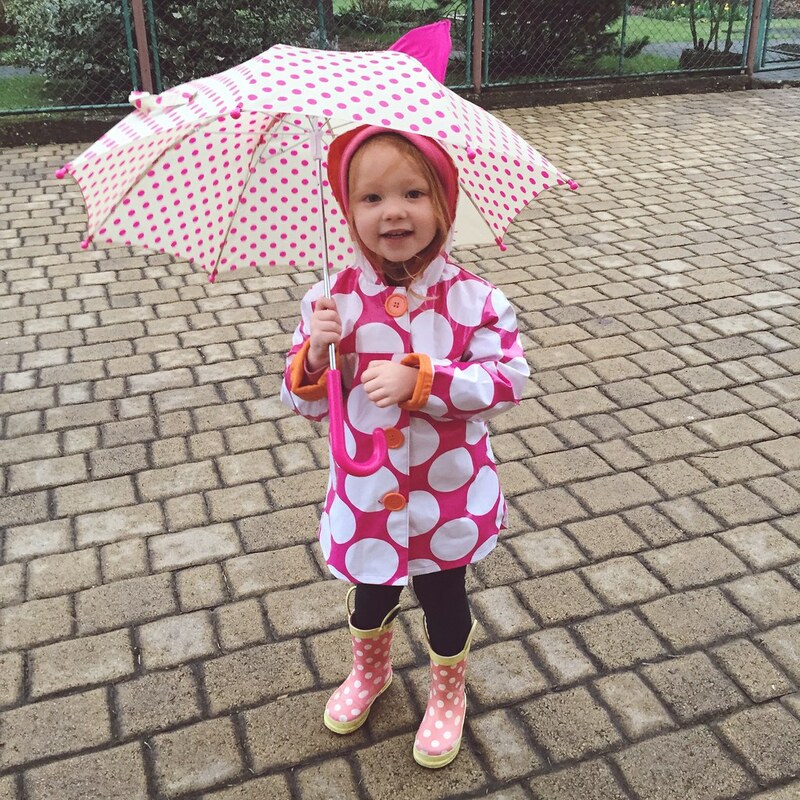 Speaking of the weather, it’s been a little wild here in Czech. This afternoon we saw rain and hail, but tonight there were crashes of lightning, thunder, and heavy rains as we were getting the kids ready for bed. Like yesterday it was pretty gloomy and cold today, but the sun broke through late in the day and gave us a wonderful view from our kitchen. Above is a fifteen second timelapse video I did, but it’s actually tewnty minutes of footage that has been condensed down. Before Bethany came home today we had some unexpected visitors. Zach and Kara stopped by late this morning because they were in town for a Czech conference. I actually didn’t know they were going to be in town, but it was nice to see them for a short time this morning. They moved to Prague late last year and they used to be only about twenty minutes from us. They brought the kids some chocolate and treats and even a few things for Bethany and me, so that was fun. One thing they brought are these caramel wafers that melt in your tea or coffee…mmm…can’t wait to try those. And with that, I’m out! Today was day two of just daddy an the kids and thankfully it was about as uneventful as yesterday. Titus struggled a little bit today going to school, but I think Mondays are generally tougher for him since he’s had the weekend off and then goes back. I never thought this would happen in preschool, but Titus tried to convince me today hew as sick and said, “Dad, I’m sick…see!” and began fake coughing. Of course, I’m not OK with him lying so we dealt with that, but in my heart I was kind of laughing because that’s one of those classic “I don’t want to go to school today” things. I mean, John Hughes even made a whole movie about it. In the end we did get him off to school and I think he did alright. Above you can see a photo of Avery outside of Titus’ class when we picked him up this afternoon. 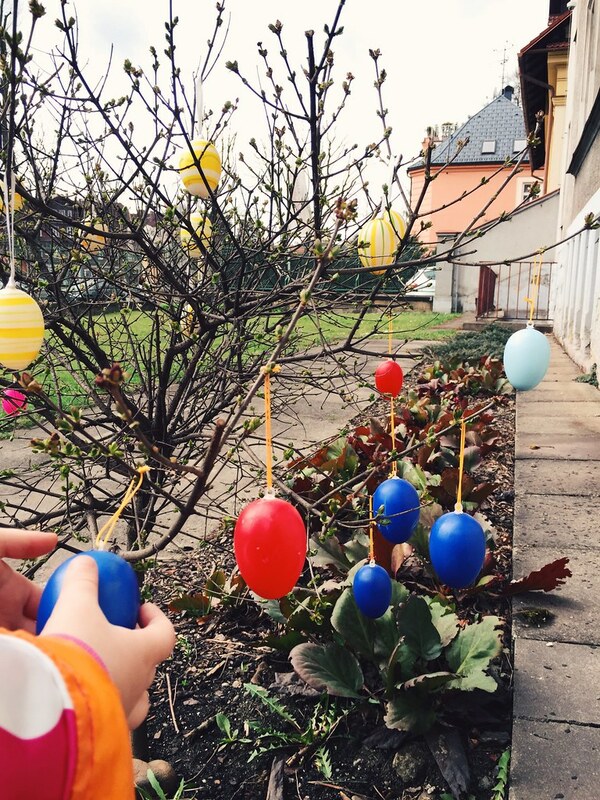 Hanging on the little bush outside were plastic eggs which I just assumed were from the kids. Titus told us as we left that his class had done that and I asked him which one and he picked red (no doubt that choice is because he loves Lightning McQueen). In the photo below Avery is touching the blue one, but the closest red one is the one Titus said was his. He also said they colored eggs and played outside, but I honestly never really know if he’s telling me about something that happened all today or compilation of a few days. Speaking of Easter eggs, we have a box of plastic eggs called “Resurrection Eggs” that Bethany made a year or two ago. This afternoon the kids really wanted to go through them and they walk through the story of Jesus during the Passion Week. Each little egg has something inside like nails, thorns, rope, etc. that all relate to the verses regarding Jesus’ death. I had a really good time talking it through with them and even using the Bible we read them every night to show them pictures and relate the story for them even more. I’m amazed at how much the kids can remember and I also love that when we get to the last egg it’s completely empty! Avery knew what was coming already and said, “See! Jesus is alive!” Just that simple exercise of walking through the gospel with my kids was a blessing to my heart and a reminder of what we will celebrate this Sunday. I really am thankful my kids are hearing about these things at such young ages. It was pretty cold and rainy today and it even hailed more than once. But the sun came out for about 15-20 minutes this evening while I was making dinner for the kids (oh yeah, I make a mean frozen chicken nugget). Since the sun was low in the sky it made everything golden and I ran out with my iPhone and took a few photos. From gray to gold is such a contrast so it’s always strikingly beautiful when that happens. 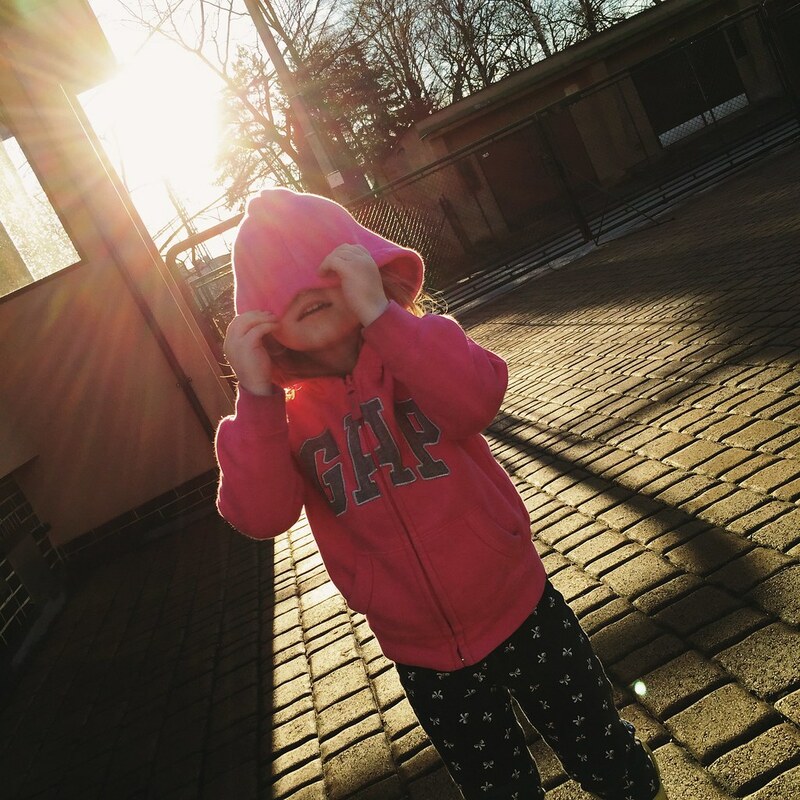 Above is a photo of Avery being silly with the sun shining behind her. 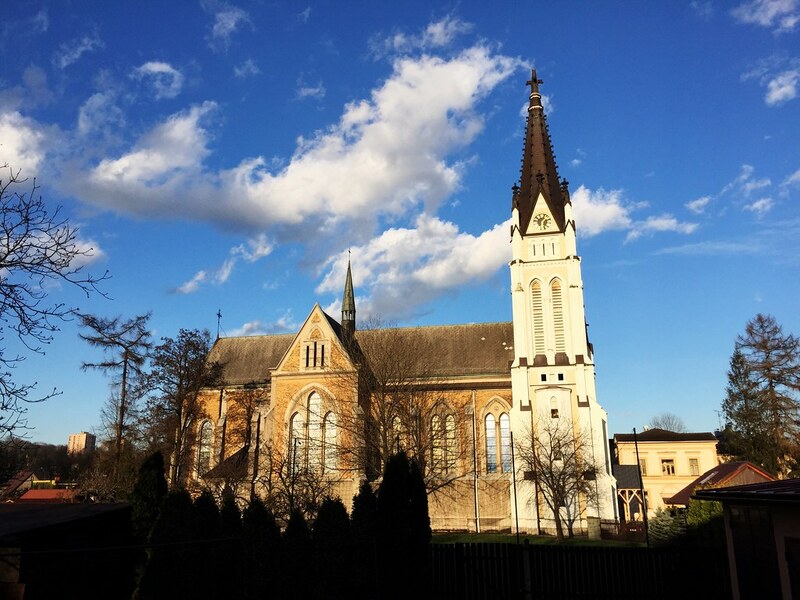 And below is a photo of the church next door when the sun was at it’s brightest. It looks like the storm clouds are rolling away, but only a few minutes later it was dark and overcast again. Either way, I’m thankful for just a few minutes of that wonderful sunlight. Bethany called us from Poland tonight for a few minutes, but those turned into the the most exciting moments of the day. A few minutes into our phone call Titus knocked an entire cup of water on the table, chair, and floor in the kitchen and Avery dropped a little toy that has colored oil in it and it broke. Naturally this cut into our talk time and I had to hang up, but I think I’ll give her a call when I’m done writing this. She’ll be back tomorrow afternoon and I hope she has had a good time. She said it was stormy in Krakow today too and that they had been doing a lot of walking, but I’m sure I’ll get more of the details when we talk later. Overall, I think the past few days have gone fine and I’m thankful that she was able to get away. But…I really can’t wait for her to come back! Bethany left this morning for a Josiah Venture women’s retreat in Krakow Poland which left me and the kids at home alone. Today was an unfortunate day for this to happen because it just so happens that it was the day in which the Central European Timezone pushes the clocks forward thus meaning we lose an hour of sleep. Bethany was up early getting ready for her trip and even had time to go to the grocery store for a few more items so I would have food for the kids me (yeah, she’s awesome), but even she admitted she had misunderstood the clocks this morning thinking it was earlier than it was. With the time change, Bethany leaving, and church already being difficult enough I actually decided to not try and push it today with just me and the kids and we didn’t go. I was up and showered in time to make it for Palm Sunday, but the thought of trying take Titus to his class and then sit through Avery’s with her was just a bit much for me. Even Avery is still coughing a lot for sickness so I just thought we’ll see Bethany off and call it a morning. 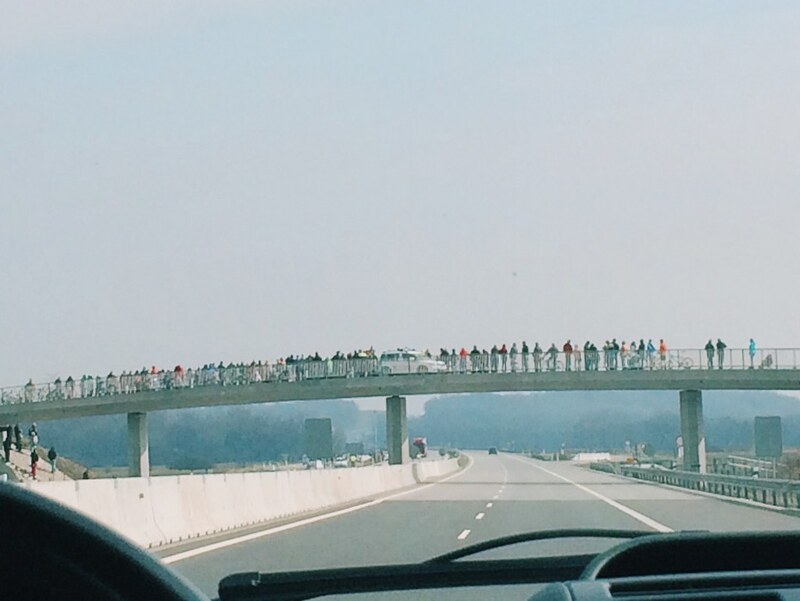 A little after she was picked up, I got a text from Bethany telling me she was still on the Czech side of the Czech/Polish border and that they could see crowds of people lining the overpasses and highway. If you follow the international news at all, then you might be aware that the U.S. is kind of on a parade right now through Central Europe as a show of force to the nation of Russia. I believe it’s part of a NATO deal, but the U.S. military has been driving tanks and military vehicles through Czech and other countries and I think they will eventually stop on the eastern side of Germany. Today, Bethany and the other woman happened to be driving the main highway where the military was driving and above is a photo Bethany got of onlookers. Bethany told me on the phone that it seemed most people were for the event (some even flying American flags), but she definitely saw the protestors. If you check the news, it’ll mostly be biased towards the voices who are against this show of force, but I’ll save the politics of it for another writer. However, it should be noted that the Czech government is supportive of this event as Czech and U.S. are allies. Also, here’s a few videos Bethany captured while they were driving. U.S. Military in Czech (1 of 2) from Shay on Vimeo. U.S. Military in Czech (2 of 2) from Shay on Vimeo. My day alone with the kids actually went alright. Before lunch I ended up taking them to a local play place and letting them play for an hour. As we left our house I could lots of people walking towards the Catholic church holding branches (or “fronds”) in honor of Palm Sunday. 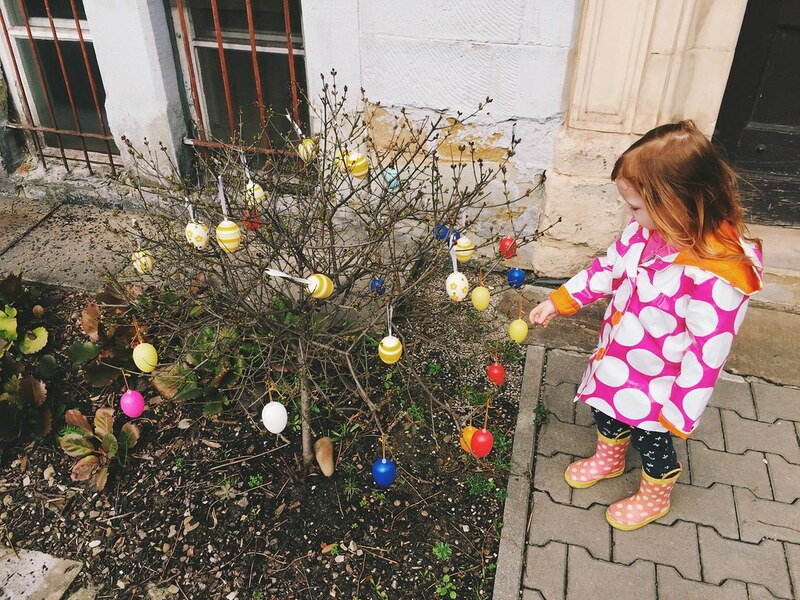 Over the weekend we saw a ton of people picking up branches and sticks throughout our area and we wondered what it was all about and now I’m starting think it was for Palm Sunday. I did manage to make both lunch and dinner successfully with the food Bethany was kind enough to provide (along with a little schedule!). There was only one blunder involving a hand mixer and a jar of peanut butter but my pride won’t allow me to write about it here. We did naps this afternoon and afterwards we headed over to the nearby park for a little fun outside. It was still pretty cool and overcast today, so we didn’t stay long before heading back home and getting dinner started. 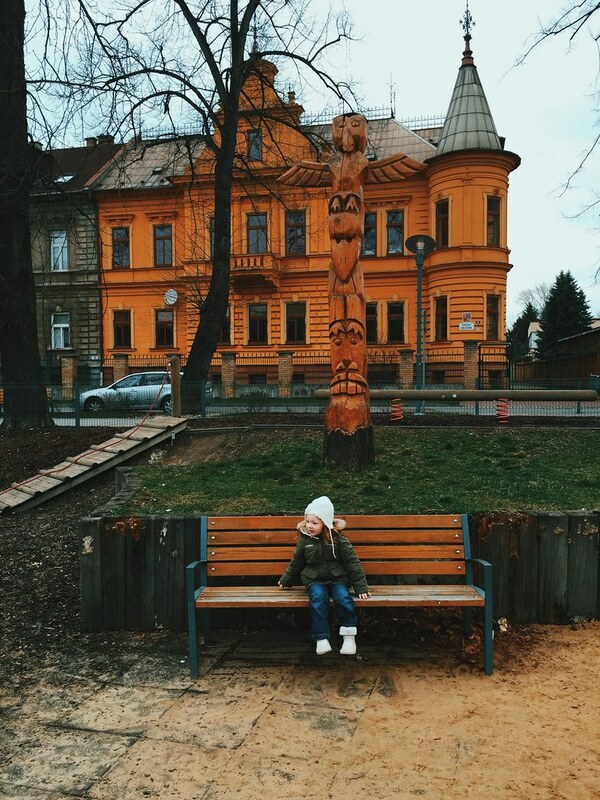 Below is a photo of Avery sitting on the bench at the park. Tonight we did bath and Bible time together and even spent a little time talking with mommy over FaceTime video chat. Titus kept saying all day that he “missed mommy,” and then would ask, “What’s today?” (as in, “What’s the day today?”). I told him, “Sunday” and he said, “Then Monday…and what’s after that?” “Tuesday,” I said, to which he quickly replied, “And that’s when Mommy comes back!” Yup. She’ll be back on Tuesday, but I hope she’s enjoying a little time away with some of the other women in this ministry. I’m trying to do more than survive this, but actually enjoy it and I can definitely say today was a success. It was fun to spend focused time with the kids, but we’ll just have to see how tomorrow goes. Bethany will be leaving tomorrow morning to go to a women’s retreat with other Josiah Venture ladies, so we’re prepping the house for three days without mommy. 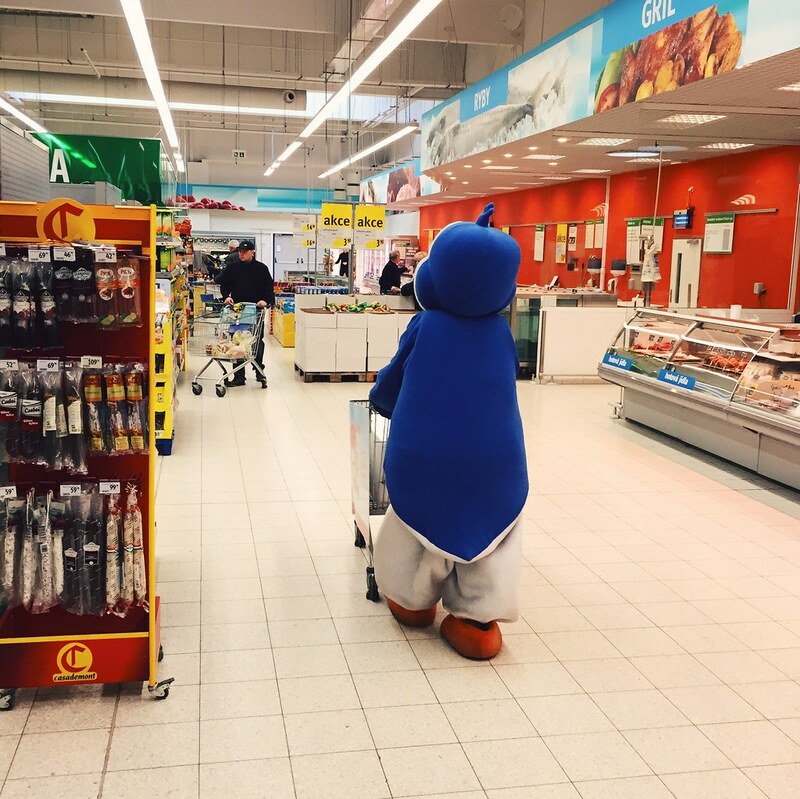 Of course, this includes making sure that Daddy can actually take care of the kids and feed them so we headed out today to stock up on groceries. We realized late last night that Bethany forgot her cell phone at our friend’s house so we ended up driving out to a different grocery store than we usually go to and I’m glad we did. We don’t have an Albert (that’s the name of the store) in our town, so whenever we can shop at one we take the opportunity. They have a great selection of Mexican food which is probably more than half the reason I want to go there, but they also have different products and brands that we don’t get often (including Dole bananas and Mission tortillas!). 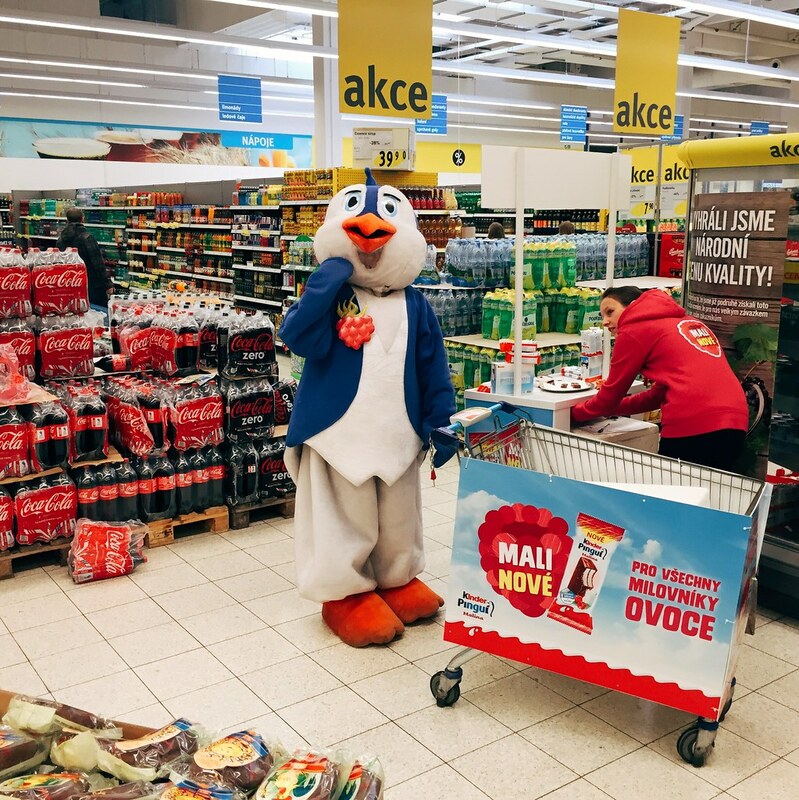 Today they were running some kind of promotion for Kinder chocolate and there was a giant penguin walking down the aisles pushing a cart. At first it startled the kids and me, but then I just began laughing. Titus actually spotted it first and squealed “Woah!” as it passed by us. Later we saw the penguin again and a women’s voice was coming from it in Czech. I told her I didn’t understand, but then she started speaking perfect English and said, “You and the kids can take a picture with me!” I was open to it, but the kids were a little scared so I didn’t push the point. I just ended up taking the photo above of her and they gave the kids a few pieces of chocolate which they enjoyed. You can definitely be praying for Bethany as she’s away, that it would be a restful and fun time with the other women. And you can pray for me as I take care of the family here at home from Sunday to Tuesday. We’ve been trying to prep the kids, but I’m sure they’ll be a little sad when they realize mommy will be gone for two nights. I’m actually looking forward to some focused time with the kids, but I’m secretly glad there’s a McDonald’s within 30 minutes of our place just in case things don’t go well for me in the kitchen! Tomorrow we’ll be pushing our clocks ahead an hour and I’m not looking forward to losing an hour of sleep and then having Bethany leave in the same day. I guess we’ll just have to wait until tomorrow’s blog to see what happens. As you can probably tell from the photo below, it was a little rainy today. I don’t think the sun came out at all and I woke up this morning to rain hitting our windows so I assume there was just a little bit of a breeze. The temperatures dropped significantly from where they’ve been, but that didn’t stop Avery, Titus, and me from going outside later this afternoon and playing. Titus was back at school today, but he struggled again this morning. He’s been out all week with sickness, so that’s not too surprising. Bethany took him this morning and he was really wanting her to pray with him, which of course she did. It’s hard to evaluate how he’s doing there, but we have noticed when we pick him up the other kids will say goodbye and he just kind of ignores them. This has always been a concern for me that he is doing the same thing to his teachers, but again we really don’t know. We just got back tonight from spending some time with another missionary family. The wife, Lauren, is going to be helping us with all the hospital and baby stuff and we had a great time talking through the details tonight. Lauren has delivered all four of her own kids here in Czech, speaks Czech, and is actually a certified doula in Czech! She knows a ton about the systems and how the hospitals work so tonight we had dinner together and our kids played with her kids while talked through some of the process of having a baby in Czech. Mostly it sounds similar to the States, but there are still many cultural things that are different and will probably come up. It’ll be nice to have Lauren’s help and we’re blessed to have her be part of this journey with us. That’s all from me. Good night!